There are many ways to get a great view of mountains. One however requires very little effort on your part. 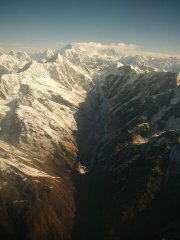 Hop on a plane and fly over the Himalayas. The view from above is incredible. The one- hour flight takes you over glaciers and peaks giving you a truly clear picture of how really massive the Himalayas are. 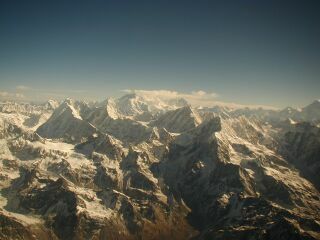 Soon after take off, the gigantic peaks come into view. First Gosaithan (Shisga Pangma) an 8,013m peak is seen followed by Dorje Lhakpa (6,966m) and Phurbi Chyachu. The other peaks come into your vision one after the other: Gauri Shanker, Melungtse, Cho Oyu, etc. On this enchanting flight every seat is a window seat and the pilot and crew help you identify peaks. Maps are distributed showing the mountain ranges seen during the flight. Each passenger is given a chance to see or photograph the panoramic view from the cockpit. This is some privilege for photographers who look for a clean window. 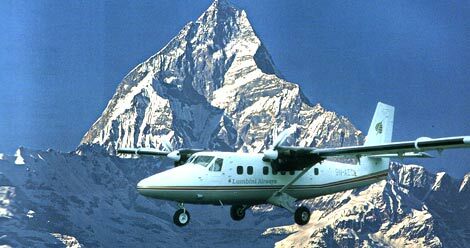 The climax comes when the pilot announces the approach to the Everest region. The sudden excitement among the passengers reminds one of how much the highest mountain in the world still means to everyone. After such a flight one begins to appreciate the true meaning of awe-inspiring. If you are interested in mountain flights and you would like me to obtain quote(s) for you from reputable operator(s), then please email me here with any dates you had in mind.